Maybe you’ve identified musicians in your church who have the potential to play for church someday but currently lack the necessary skill and confidence. How do you help them gain the skill and confidence they need to become regular musicians? My daughter, Lisa, found herself in a church that needed more pianists. This is her story of how her church encouraged her to begin playing in public. I knew how to read music and play songs written for singing in four parts. I had some training in chords and improvising for hymns, but I was far from being a good church accompanist. As I moved into a season in which I used other ministry skills, I set piano aside. However, I made a promise that I would play again if my church ever needed me to do so. Fifteen years passed. During that time, I was part of several churches, but none needed an additional piano player. I did not have access to a piano to practice on and played very rarely—perhaps once a year. Surely, I wouldn’t be needed to play piano again, I assumed. I was wrong. Within a few years, our small church lost five piano players, mostly due to moves out of state. Less-experienced players began dusting off their skills and playing. I thought I was safe—we still had several ladies who could play better than I could. But, our pianists were all young moms. A sick child, an imminent due date or even the nursery rotation could leave us short on pianists. Most beginning pianists will be intimidated if they have to play all the songs in a song service on their very first week. But there are several ways to avoid this. Perhaps on the first Sunday, the new pianist could just play for part of the song service (i.e. the first song or two before the Scripture reading.) Another piano player can play for the rest of the service. Or consider having your new pianist play “second piano” on a keyboard alongside your main pianist. This way, they do not need to be the only person playing. Keep a running list of songs the new pianist can play. Let’s say the new pianist is only able to add one or two new songs to their repertoire each week. Don’t let this become a discouragement. Over several months’ time, she will likely be able to play many of the songs your church regularly uses. This will build her confidence and likely cut down on needed practice time. Look for recordings to help the musicians get a feel for a new hymn or chorus. Some pianists need help making sure they are correctly sight-reading a new hymn or chorus. You may find that someone has posted a performance of it online. Listening to the recording will help musicians know that they are playing the song with the right notes, rhythm and speed. (It’s worth noting that some churches and song leaders choose to sing a song a little different from the way it is written.) It is easy to share a link with other musicians via email. Don’t underestimate the value of an encouraging word. When I started playing piano at church again, I was very aware of my inadequacies. In fact, the speed of congregational singing usually meant I could keep pace only by playing just the right hand. Yet our pastor, music coordinator and most talented violinist all stopped me to express appreciation for my efforts. They found things to praise in my playing and encouraged me to keep trying. This helped me to persevere in playing for church as second pianist, even when I questioned whether my contribution was valuable. I’m glad I committed years ago to be willing to play piano for my church if needed. I’m also glad for the help other church musicians blessed me with as I began that endeavor. Joyful Melodies, Volumes 1-4 by Jennifer Hall. I’ve used Book 1 for beginning students. All songs are in the keys of C, G, or F with simple hand positions. Some songs can be played as duets. This comes from a conservative Christian publisher, Bible Truth Music. Most of the songs are hymns. This book worked really well for me. You can order the books or pay for a download. Religious Favorites by James Bastien These hymns, traditional Christian songs, and songs for special occasions are slightly harder than Book 1 of Joyful Melodies. This one book gives over 100 well known hymns. 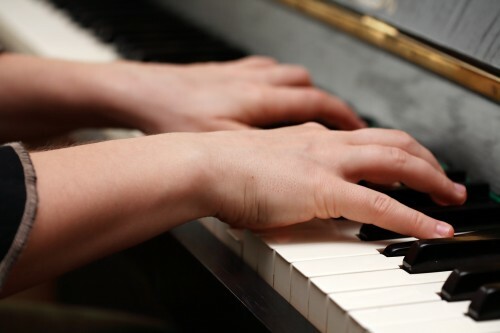 All are in the keys of C, G, or F. Most of the left hand for most hymns is largely composed of the I, IV, and V chords in their easiest playing positions. Adult Piano Adventures by Nancy and Randall Faber. This book works well for teaching beginning adult students who have had some exposure to music. The greatest part about it is that it gets students playing melodies with chords earlier than usual, which helps prepare them for playing hymns and other church music. All you need to teach comes in this one book. If, however, you have an adult student who has absolutely no musical background, she may find this one moves too quickly.